There are scenic places. There are remote places. And then there is Toroweep. I almost hate do describe it here as such as places like that pay dearly for popularity. Things should not get too bad too soon as the park service has no plans to pave the road there (a few administrations like the current one and this may be changing ...). But for now this place is protected not only by its status, being within a national park, but also its location. 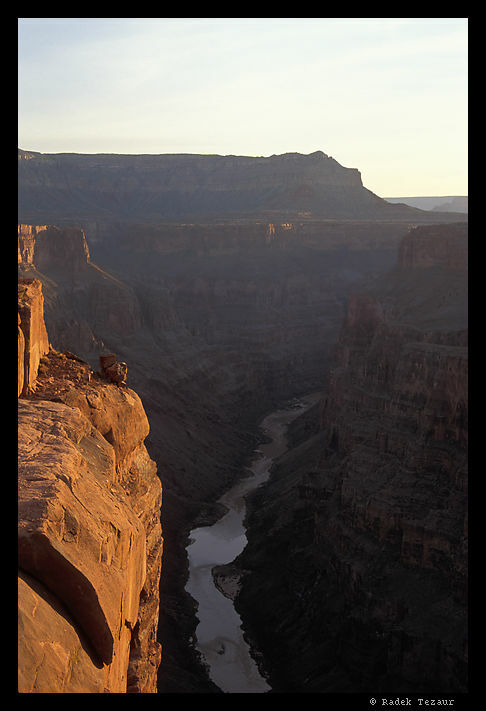 Any place on the North Rim of the Grand Canyon can be considered remote. Add to that some 60 miles of a dirt road, pretty rough in places, miles and miles of washboard rattling, and you are practically there. Near the end of the road there is a ranger station. A friendly ranger will be happy to talk to you. This is a lonely place. He flies to town to shop as three hours driving each way is a little too much. There is another distinction to Toroweep. Unlike just about any other place within the National Park system, this is a no fee area. If it were not, having driven so far, would you just turn around and go back? Or would the ranger have to protect the cash against outlaws? Either way, it makes it special. Two more miles down the road, one comes up on a small campground and a few hundred yards later arrives at the end of the road. There is two more campsites here. A few more steps will take you to the rim of the canyon. If you can fly, you can disregard the 3000ft drop down to the river. Otherwise, you should exercise caution - the canyon here is about as deep as it is wide and the walls are steep to say the least. About a half a mile downstream, it is possible to descend down to the river on a broken lava from a not so ancient volcano whose lava flow once blocked the river. Now only famous rapids remain, and you can here them all the way up on the rim. Toroweep is dark and quiet at night. Only airplanes overhead may remind you of civilization. Sleep tight and under no circumstances moonwalk.